Travel to any small town in the U.S., and more than likely there will be a street with the name of Main Street. Yet travel to Yuma, Arizona, and you’ll find a Main Street that is a rare and remarkable gem just waiting to be admired. Our Main Street in its earliest days was nestled against the Colorado River. This location provided easy access to the town’s local businesses for travelers arriving by steamboat. The street itself was 100 feet wide, specifically designed to accommodate the 20-mule freight wagons that needed to turn around before heading to the river to pick up supplies. Main Street actually has quite a seedy past. Many of the first businesses were saloons, and the first adobe home on Main Street was a brothel. The home was built in 1854 and was owned by Sarah Bowman, known as “the Great Western,” due to her large physique. The brothel had no problem attracting patrons as it was located directly across the river from an entire fleet of soldiers stationed at Fort Yuma. A man named William Westover, who came to Yuma in 1909 at age 13, opened a law office and also become a historian with a great love for his city. In his book, Yuma Footprints, he records a couple of great stories about early Main Street. Eleanor Dunn McCoy told him a story about an evangelist that came to town and could not find a building big enough to hold the services in. Another woman, Norma Stofella Folly, told a story of the big Main Street horse race between two wealthy property owners, J.M. Molina and her father John Stofella. They both had acquired fine horses which they had great pride in, so their bravados took over and the race was on. According to Westover, it was decided that the winner would get the other man’s property. Mr. Stofella put up his store and Mr. Molina put up his property on the west side of Main Street. Unfortunately for Mr. Molina, the Stofella horse outran his great steed that day and his property was lost. “After the race Mr. Molina refused to walk in front of his former property, but would cross the street and walk down the east side of the street,” recounts Westover. One of Main Street’s earliest establishments was the Turf Saloon, a two-story adobe building, with the saloon on the main floor was the saloon and rooms for rent upstairs. In an article titled, “In the old days, Yuma had some pretty wild saloons,” author B. Johnny Rube gives an account of the arrest and conviction of William T. Dutton, the owner of the Turf Saloon. During the early years, Main Street had at least ten saloons where drinking and gambling were permitted. Even the billiards and poolrooms served whiskey and iced-down beer from old-fashioned barrels. The Post Office on Main Street was the third-ranking post office in Arizona in 1955, and the stories of its early history are priceless. A newspaper article in The Sun by reporter Carl Porter, dated Oct. 23, 1955, describes a tour of the facility as well as the amazing speed and efficiency of the mailroom workers. During the tour, Porter noticed what he thought to be a giant cooling duct that surrounded the entire mailroom ceiling. According to the tour guide, The person giving the tour pointed to the supposed duct was actually a “peek-a-boo,” an enclosed balcony and catwalk designed to spy on the mail workers below when reports of missing mail became too frequent. The Yuma Theater has a diverse and colorful past as well. 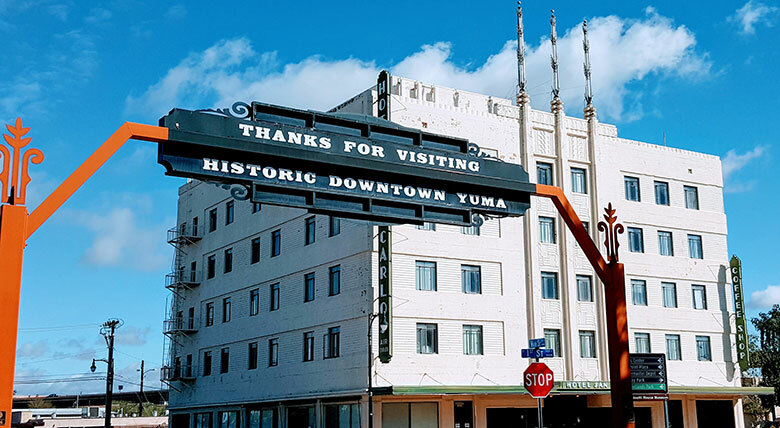 A self-walking tour guide of Historic Yuma describes its early history: “The Yuma Theater building has played an important role on Main Street since 1912. Constructed as the Zeller Theater, it functioned originally as a vaudeville and movie theater,” says historian Don Ryden. The Theater suffered loss as well, such as the 1913 fire that destroyed the inside of the theater, rumored to have been started by boys under the stage smoking cigarettes. The building was subsequently remodeled and leased to Riley’s Garage. The building boasted 11,000 square feet of floor space and was described as one of the finest “auto homes” in the West. In 1926 the owner, Anna Desmond, remodeled it again as a theater, opening it in Jan. 1927 just in time for “talkies,” and once again every seat was filled. The bank was organized in 1909 and occupied two different locations on Main Street until the current building was erected in 1924. (J.M. Molina, who seems to have recovered well from his defeat in the big horse race, was the bank’s president at the time.) The bank was a national bank so it had national currency. The currency had the name of the bank and was also signed by the bank president and the cashier. Amazingly, the currency arrived in sheets with four bills to each page. The sheets would have to be cut and trimmed with a paper cutter. There is also a fantastic story about the bank’s move from its old location to its new building across the street in 1926. A bank officer named Jim Stahl had currency piled high on his arms and was about to walk out of the bank when the new bank president J. Franklin stopped him and said, “Here, you need protection with all that money,” and he placed a rifle across the top of the currency. Yuma National Bank enjoyed their new building for only three years as the bank closed for business in 1929. The stories of these three buildings are unforgettable and the changes they endured show the resiliency of this city and of the people who strove to preserve it. Main Street’s architecture and appearance has changed drastically throughout the years. It began as a 100-foot-wide thoroughfare for freight wagons lined with adobe buildings. Many of the early buildings were destroyed by floods, and by 1900 many of the street’s structures had been replaced with Victorian-era buildings constructed of brick and wood frame. There was very little new construction during the Depression of the 1930s. It wasn’t until the 1960s that Main Street’s merchants formed an association to develop strategies for the revitalization of downtown, as the surge of economic growth in the south part of town and the new South Gate Mall had caused business to decline. Out of the association’s strategies came plans for the revitalization of Main Street by creating the Territorial Mall, transforming the historic urban vehicular streetscape into the parklike atmosphere of a modern suburban pedestrian plaza. An invitation was sent out all over the city for the ground-breaking festival, held on July 8, 1968. Howard R. Gwynn officer of the Yuma Downtown Development Corporation encouraged people to, “Come out and enjoy a short program in a shady, cool spot and watch as gold plated shovels and bulldozers turn the dirt.” It was a grand spectacle complete with the Governor and a Senator of Arizona and local business leaders mingling and enjoying refreshments with Yuma’s residents while mariachi bands played in the background. The Territorial Mall was completed in October of 1972 and it turned out to be a tremendous success for the merchants who fought so hard for the redevelopment of Downtown Yuma. The quaintness of Main Street in small-town America has been alive for centuries. The narrow storefronts and small old-fashioned display windows in shops bring out the individuality of the rows of businesses. On Yuma’s own Main Street, from the street’s earliest stores and saloons to its redeveloped urban shopping mall, the goal has always been the same – to be a gathering place for all kinds of people and activities, where exciting things are happening and locals are drawn to the spirit of downtown. Yuma’s fascinating history is worthy of being discovered, and the surprising stories of Main Street make it a rewarding place to visit. Visitors can’t help but stay awhile and enjoy it. Yuma. Boxes 21, 107, 155 &156. Love, Frank. A Visitor’s Guide to Historic Yuma. Little London Press, 1982. Nelson, Robert. Images of America Early Yuma. Arcadia Publishing, 2006. Sites. Graphic design, editing, and compilation by AIA/Architects, Inc., 1989. Westover, William H. Yuma Footprints. Arizona Pioneers’ Historical Society, 1966.